Upon opening the doors at Juvelisto Design in 2011, the same question kept arising from our patrons “Do you teach jewellery making classes?”. In the early days of Juvelisto, we simply didn’t have the space, resources or time to facilitate a jewellery school but it was then that the dream began. Sasha and her staff began brainstorming and manifesting how and where they could open the school. By serendipitous chance, our neighboring retail space became available and we knew right away the right time had finally come to build the Juvelisto School of Metal Arts. 2014 was spent designing and custom building our unique jewellery school workshop as well as creating the curriculum for our classes. The registration for our first few classes on the schedule sold out quickly and we opened our doors to teaching in April of 2015. Since opening Juvelisto School of Metal Arts, it has been nothing but a pleasure and an exciting adventure for us at Juvelisto, truly a dream come true. Our staff and instructors have so much passion for jewellery making and find it such an honor to be able to share their beloved craft with our students. Juvelisto is a fun and inspiring atmosphere and a great group of people to work with. We require our goldsmiths to have at least 10 years of professional experience making handmade pieces of jewellery (gold, platinum, silver). Duties will also include stone setting, resizing, mounting, and expert repair. We always love when someone joins our team bringing new perspective and ideas. To apply please include a short description of yourself and your resume, photographs of your recent work and trade references if available. We are looking for an experienced goldsmith / bench jeweller to join our busy jewellery design studio. We have both part-time and full-time positions available, compensation will be on an hourly basis, the hourly rate will be negotiated depending on experience. We are looking for an experienced goldsmith that specializes in gemstone setting to join our busy jewellery design studio. This position requires that the goldsmith have the ability to perform the following types of stone setting: Pave, channel, tension, gypsy, prong, and bezel. We have a part-time gem setter position available, compensation will be on an hourly basis, the hourly rate will be negotiated depending on experience. Juvelisto School of Metals Arts is looking for a new part time instructor to join our team. To apply for this position we require that the individual applying has multiple years of jewellery making experience in different techniques or specializes in a specific jewellery making technique. It would be beneficial for applicants to have experience in jewellery instruction but not necessarily essential to apply. We are looking to expand the jewellery making courses on our current schedule, adding new classes and more days/evenings during the week and/or weekend. We are open to new ideas and what the skillsets the applicant brings to the table. This position is open ended in a way that we will schedule classes that fit within our current class schedule and your schedule. You availability and skill set will determine which classes you teach and how often you are scheduled. Those who wish to instruct at Juvelisto School of Metal Arts must be vibrant, outgoing, skilled and patient individuals that are passionate about their craft. We strive to make our school a fun and educational environment. Our instructors are paid on an hourly bases and the rate is determined based on experience. Private contractors are welcomed as well. The best way to describe our studio, in the words of one of our instructors, is “this is the space I wish I learned how to make jewellery in”. The Juvelisto School of Metal Arts Studio is a truly inspiring space, for at every turn you are surrounded by metal art and contemporary interior design. The focal point of the studio and centre of the creation process begins with the 8 seater custom jewellers bench built from reclaimed wood and hand-forged wrought iron. Each individual bench space is fully equipped with a torch, soldering station, flex-shaft and full set of essential hand-tools. Having each student fully equipped in the classroom means less waiting and more creating! Throughout the classroom is a variety of different shared equipment pieces such as specialty hammers, rolling mills, vices, metalsmithing stumps/anvils, precision tools, punches, stamps, tumblers, cleaners, a kiln, melting station, and much more. Our school strives to make the learning environment a clean, fun, positive, and inspiring one but most of all, we want to make our space your happy place. Each student must sign a legal waiver of responsibilities upon arrival to the classroom. Minimum age requirement for our courses is 16 years old and a parent or guardian must sign the legal waiver of responsibilities. We require each student to inform us if they have any health issues that may hinder their ability to follow instruction or operate machinery prior to signing up for a class. We require each student to inform us if they take any medication that may hinder their ability to follow instruction or operate machinery prior to signing up for a class. For the safety of our students, we will ask an individual to leave the class if they appear to be intoxicated. We do not tolerate any verbal or physical abuse towards our instructors, staff or other students. Ultimately, we want our classes to be a fun, enjoyable and safe experience for every student. We offer a full refund only if cancellation is received more than 14 days or more prior to the first class. Notice must be received by email, telephone or in person. We offer credit towards another class if cancellation is received between 48 hours and 14 days of class beginning. Notice must be received by email, telephone or in person. There are no refunds or credit if notice of cancellation is received less than 48 hours prior to the class beginning. No refund will be issued for cancellation after the class has begun. There is no refund or credit offered for missed classes. In the event that the instructor of the program falls ill or there is weather that inhibits the instructor or students from attending a class, that particular class will be re-scheduled for the next available date. We require a minimum registration of four students per class to go forward with a scheduled class. If we do not have enough students enrolled we will cancel the class. In the event of a cancellation we will issue a credit or a full refund. Do I have to have any previous experience to take a jewellery class? A majority of our classes are beginner friendly as our instructors teach each class as if every student has absolutely no experience. Do I have to provide my own materials, tools or supplies? If registered in one of our courses, all of the materials, tools and supplies are supplied and included in the cost of the course. Do I have to be creative to take your courses? Of course with every art form, creativity is always an added bonus but since most of our classes are project based with a set design, creativity is not essential and you will be taught the technical processes. Will I finish the course with a completed piece of jewellery? Our programs are designed so that each student leaves with a finished piece of jewellery. If all classes in the curriculum are attended and each step is successfully followed, every individual should leave with a beautiful piece they created themselves. Mistakes do happen from time to time but our devoted instructors try their best to assist in correcting these mistakes to help you leave happy with a completed project. Some of our classes allow more design freedom than others, depending on course in question, it is best to ask the instructor at the start of the program. Generally design freedom is welcomed if the customization does not require a different skill set to be taught to the individual student. Do you teach how to work in gold? We have recently incorporated two new classes into our scheduled program that allow our students to work with gold. The two classes that offer this skill set are: “Make Your Own Wedding Rings” and “Relive or Renew”. We also offer private classes for those who would like to learn specific skill sets that are not offered in regularly scheduled classes. Can I use my own silver/gold? To utilize your own material it would require you to disassemble your existing jewellery pieces, melt down the metal and create your own material which is a skill set taught in “Making Material and Metal Manipulation”. Unfortunately due to the lengthiness of this process, the timeline of our other courses do not allow for our students to use their own material. All materials are included in the cost of our courses. Can my friend or partner come and watch while I learn? If you can imagine going to the movie theatre, paying for your ticket, getting to the door and asking if your friend can come watch for free, obviously the answer would be “no” as each person attending the movie is required to pay for their ticket. The same concept applies to our classes, we require each student attending the class and learning from our instructor to pay for the course. In the jewellery making process we do use some chemicals and compounds that may have minimal amounts of toxins in them. For one to be affected by the toxins they would have to be exposed to the substance continuously, in a very confined space for an extended period of time (years and years). In each of our courses our instructors teach about the safety involved with different chemicals and compounds and we have ventilation systems and masks that are used when needed. During all day courses, is there a lunch break and where do we eat? In our all day workshops we allot at 30-45 min lunch break. You are welcome to bring a lunch, we have a fridge and microwave that are available for our students to utilize. Otherwise, Steveston is teeming with cafés and restaurants for you to choose from. Sasha Shkolnik first studied at the State Art School in the Ukraine where she learned many different forms of art. She designed theatrical props, painted with oil and moved into making ceramics for a few years just to find herself creating jewellery out of clay and porcelain. It was then she knew that in order to express her talent to the best of her abilities she needs to learn metal arts. Upon finding her new home in Canada it was then that she realized that she must pursue her jewellery passion. 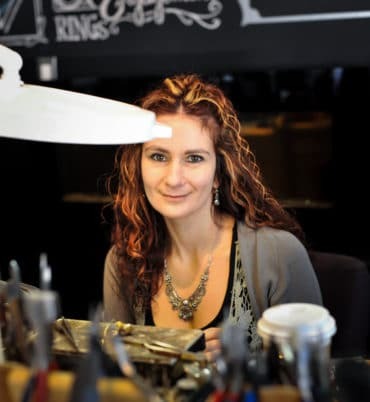 Sasha went back to school to study Jewellery Art and Design and continued on that path for nearly twenty years working as a professional goldsmith for some of the most renowned jewellers in Vancouver, BC. In 2008, Sasha opened a home based studio in Richmond, B.C. where she began designing and creating custom pieces for private clients all the while still working full time for two other jewellery companies. Over the years the number of clientele had grown, so in 2011 Sasha decided to venture out on her own and open a retail jewellery store and design studio in a beautiful historical part of Richmond, B.C. An occasional weekend walk in Steveston Village resulted in spotting a lovely storefront available for lease and Sasha had an instant vision of her future business. In March 2011 Sasha’s company, Juvelisto Design, opened the doors for the first time. 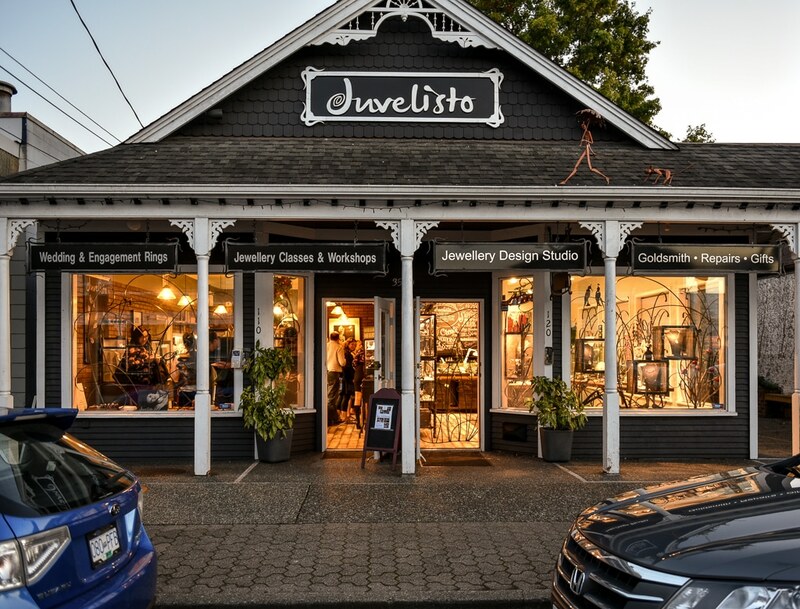 Immediately Juvelisto created interest among the locals and visitors of Steveston. Since its opening, Juvelisto has been very successful because it has developed a reputation of being known for its extraordinary level of craftsmanship and customer service. Since opening Juvelisto Design, Sasha had dreamt of opening a jewellery school and that dream came true when she opened the doors to the Juvelisto School of Metal Arts in April of 2015. Leanne Guthrie has been working at Juvelisto Design since 2011 alongside Sasha Shkolnik as a goldsmith and professional sales staff. Leanne first tried her hand at jewellery making in 2002 while attending high school in Cloverdale, B.C. After graduating high school, she went on to study Jewellery Art and Design and Gemmology at Vancouver Community College, achieving the honor of distinction for graduating at the top of her Gemmology class. Since her introduction to the jewellery industry Leanne has worked in various areas of the jewellery industry from jewellery supply, jewellery sales and has worked for multiple designers helping them bring their jewellery concepts to life . In 2009, Leanne started her own home-based jewellery business, a line of sterling silver and gemstone jewellery called LeaFloria Jewellery Creations. In 2014, Leanne assisted Sasha Shkolnik with the conception and creation of Juvelisto School of Metal Arts and is now the instructor for many of the classes offered at the school. Andrea Roberts, a certified goldsmith, is originally coming from Germany, where she received her education and European Goldsmithing Diploma at one of the oldest and finest European trade schools – Goldschmiedeschule Pforzheim. She worked alongside Master Goldsmiths and set up production departments, participated in numerous craft shows and was responsible for store production and support before moving to Canada 1996 where she established her own studio. Since 1999 Andrea is a Circle Craft CO-OP member. In 2004 one of her pieces was commissioned by the former Governor-General, Adrienne Clarkson as a present of state for her majesty Sonia, Queen of Norway representing Canadian Arts and Craft. “I am motivated by originality from the inspiration of an idea to the finish of the design execution and process. Each piece I am creating becomes a creative statement, unique in shape, color and texture”. Andrea is also a passionate educator and facilitator fostering new talents that emerge into our vibrant art community. Since 1999 she is teaching jewellery making programs with VSB Continuing Ed, Langara CS @ VSB, Juvelisto School of Metal Arts and her own private studio. “I love to mentor students and help them advance and explore their artistic vision. Creating opportunities where professionals share their knowledge is vital to maintaining a healthy community where our human experience can thrive best”. Heleen Heuvelmann is originally from the Netherlands where she received her training as a goldsmith at the Vakschool Schoonhoven (part of Zadkine College). For nearly 15 years, Heleen worked for different goldsmith ateliers and jewellers as well as having her own workshop at home for repairs and custom work. Since moving to Canada, Heleen mainly creates her own collection of jewellery and was first introduced to Juvelisto upon her inquiry to rent a monthly space in the workshop to create her unique designs. Heleen mainly works in sterling silver but she also likes to work with copper, brass, gold, and often incorporates gemstones into her designs as well. One of her favourite jewellery making techniques is anticlastic raising, which she now specializes in teaching here at the Juvelisto School of Metal Arts. Heleen finds her inspiration from her travels to all parts of the world, different textures in nature, and the shape of the stones she uses in her designs. Fiona completed her training as a jewellery designer/ maker in the UK. Completing a BA in 3D Design in 2010. Followed by Post-Graduate study at the renowned Bishopsland Educational Trust workshops. Bishopsland is a centre of excellence for jewellers and silversmith. Here Fiona learnt from master Gold and Silversmiths techniques such as hand engraving, gold fusing and chasing and repousse. Following this Fiona worked as a freelance jeweller for over 4 years in London whilst also setting up her own jewellery brand. In 2016 she was selected to exhibit at the Goldsmiths Fair in London. The premier event for showcasing contemporary jewellery and silver in the UK. A desire to create jewellery that will last a lifetime continues to push Fiona’s creativity and love of working with precious metals. Fiona is now based in East Vancouver where she makes jewellery for retail and to commission. Naomi Evans worked as a successful studio potter specializing in functional carved porcelain after completing both a BFA and an MFA in Ceramics. Naomi was always fascinated by jewelry and returned to school at the North Bennet Street School in Boston, MA where she retrained as a Jeweller. In 2004, she moved from Cambridge, MA to Vancouver BC, where she works as a studio jeweler. Naomi uses traditional fabricating and stone setting techniques, incorporating silver, gold, gemstones and beads into her designs. She has always put great emphasis on function so her collection of jewellery is both comfortable and stylish. For Naomi, nature, architecture and utilitarian crafts are some sources of her inspiration. Naomi has also been teaching jewellery making for many years and is now sharing her knowledge at Juvelisto School of Metal Arts.